The Singer 2517 sewing machine has a removable drop-in style bobbin case, which makes the removal and replacement of the case simple and quick. Since bobbin cases are not interchangeable, a replacement bobbin that is compatible with the Singer 2517 sewing machine must be purchased. 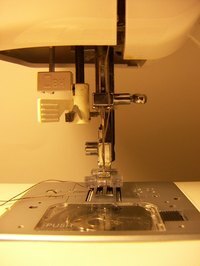 Replacement Singer sewing machine parts can be found at on-line stores such as Sewingpartsonline.com and often on eBay. Unplug the sewing machine before attempting to remove parts or clean it. Turn the hand wheel on the side of the machine to raise the needle. Push the lever behind and above the presser foot up, to raise the presser foot. Open the plastic slide plate above the bobbin case. Unscrew the needle plate with a small screwdriver. Lift it up and slide it to the side, to clear the presser foot. Set the needle plate aside. Turn the bobbin case holder as far as it will go toward the back of the machine, with a screwdriver. Pinch the left side of the bobbin case with your thumb and forefinger. Lift the case up and slide it out. Find a replacement bobbin case that is compatible with the Singer 2517 sewing machine. The Singer 2517 requires a drop-in style replacement bobbin of the bobbin class, 66. Slide the new bobbin case under the fabric feed, with the split side directly under the feed. Move the edge of the bobbin case under the position plate at the corner of the bobbin case opening. The bobbin should travel freely along the hook race. Lock the bobbin case into place by twisting the bobbin case holder forward. Turn the hand wheel to check the mobility of the bobbin case, and ensure that it is inserted properly. Screw the needle plate back over the opening for the bobbin case. Place a bobbin in the case. Put the plastic feed cover back onto the machine.